This trail is devised particularly with those interested in genealogy in mind. Due to the distance the churchyards are apart we have put this trail as being driven by car. 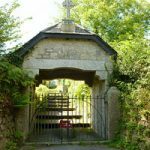 That is not to say you can’t go round by bike or even walk, come to that, but we thought that those that are most likely to want to view all the churchyards are also most likely to do so by car. A lot of the churchyards are on the individual trails as well and well worth stopping to view. 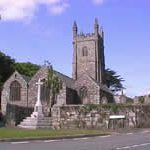 Stithians Church and its churchyard have been a consecrated place for Christian worship and burials since Celtic times. The present sanctuary area of the Church is thought to be built on the site of a chapel of the 5th century. The church has undergone several major extensions and changes over the centuries. Evidence of its architectural history can be seen in its fabric. 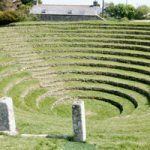 The St Stythian we know today is thought to have been a female Celtic hermit or anchoress and was closely associated with the local Holy Well. Traces of this Well, known as Lady Well, can still be seen on the southern boundary of the agricultural showground where it abuts the edge of Kennall Vale woods. The church is thought to contain at least 10,000 bodies and has been closed and reopened several times over the centuries. It is particularly beautiful in the spring and early summer when the bluebells provide a carpet of colour and the cherry tree is in bloom. 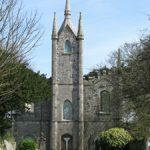 The original churchyard surrounded Christchurch but was only used between 1845 and 1854 and just a few headstones have been found there. 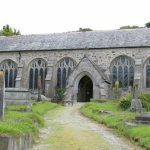 Burials were mainly carried out in Gwennap until this second churchyard was established on the 8th August 1911 by Act of Parliament and it cannot be formally closed without Parliament’s consent.